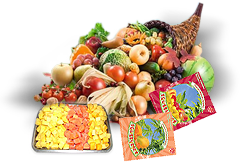 Welcome to IQF Foods Private Ltd.
IQF Foods produces Tropical Fruit, Ethnic and International Vegetables to customers' specifications for quality and taste at globally competitive prices. Our products are processed within hours of harvest, thereby maintaining their 'just picked' freshness. We cover an extensive range of fruits and vegetables including Indian ethnic vegetables that are processed in accordance with their seasons and market demand.